Between adjusting to the back-to-school routine and some major changes at work, I totally missed the two-year anniversary of this blog. Normally I would do recaps and reflections and yadda, yadda, yadda, but I’ve already done a few of those already (yes a few, even though it’s only been two years, since there’s the year-end recap and the anniversary recap). So I’ll just type out a few notes of nostalgia and be done with it. I remember so clearly that day at work two summers ago when I was checking the TV listings of our local PBS station to clarify information for our newspaper’s calendar. And then there at the bottom of the screen was a video promoting a recent interview with Rick Springfield. I knew I’d have to check that out, and did so a couple of evenings later. I was shocked to find out he had just released a novel and before that, an autobiography. Although I was a huge fan when I was younger and still cranked up “Jessie’s Girl” when it came on the radio, I hadn’t followed his career in years and had no idea what ever became of him. I immediately put both books on hold at the local library and did some Googling to find out what he’d been up to. Watching YouTube interviews brought back so many memories that had long been buried, such as song lyrics and the way RS used to lick his lips during interviews. After reading his documentary, “Late, Late at Night,” I recreated my reading experience by putting together a little blog with links to the videos illustrating some of the stories he told: Late, Late at Night Musical Journey. Next I started this blog, My Rick Springfield Crush, because I was so excited about rediscovering my favorite rock star, but nobody else in my real life was all that interested. I never imagined that two years later – and 212 posts later (this one is #213) I’d still be writing it. I had no idea there’d be so many new things to write about: two CDs (The “Stripped Down CD/DVD” and “Rocket Science”), two movies (“Ricki and the Flash” and “Traces”), TV shows (“True Detective” and “Supernatural”), as well as numerous interviews and concerts. And even when I formally ended the blog about 20 posts ago, I still found myself coming back to write more. The same week I saw that initial interview in July 2014, I learned that he would be in town for a concert a few days later, but unfortunately I wasn’t able to afford the tickets (and I also found out he’d been in town earlier in the year to promote “Magnificent Vibration” at a local bookstore. Obviously I was oblivious.) Nearly two years later, I was in the second row at the same venue and got a picture with him after the show. In between those two shows, I had seen him in concert five other times – briefly meeting him twice. I guess you might say I got a little hooked (Or you might say something else. Whatever). Well, this post became a little more recap-y than I intended and I haven’t even written anything about RS has inspired me in other aspects of my life. Fortunately if anybody is interested, it’s already been covered in previous posts. You can even start back down in the August 2014 archives and read all the way back up to today if you want to. There are lots of good RS pictures and videos embedded along the way. For anyone who is still reading (the current number of all-time views is 15,613, which means there are LOTS of people searching for information about Rick Springfield), thank you. 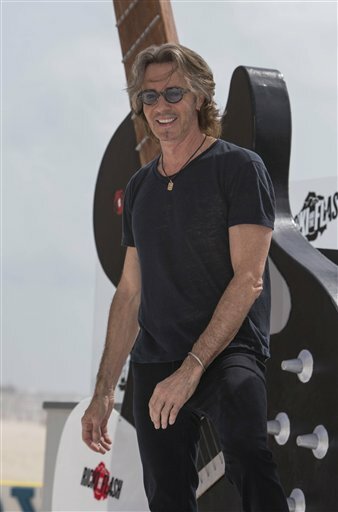 Yesterday on Rick Springfield’s Facebook fan page, there was a photograph of RS and his band in the studio with the caption “Rehearsing for the next record.” Needless to say, the post received a number of likes – more than 4,700 so far – and more than 200 shares and comments. The announcement gave RS fans another dose of anticipation for the upcoming year – so far we’re looking forward to the release of his next movie, “Ricki and the Flash”; the sequel to his best-selling novel, “Magnificent Vibration”; his episodes on “True Detective” (for those with HBO); and upcoming concerts for both full-band tours and “Stripped Down” tours. And now more new songs! So in the spirit of new songs for the new year, I’m going to share my first song of the year – not anticipated by anybody but I’m going to share nonetheless. Though I only feel like sleeping.